Please help by thinking carefully about whether you need to go to the Unit to be treated. – Do you need to see a healthcare professional or could you treat yourself with over-the-counter remedies? Your local pharmacy can give you great advice on helping yourself – just pop in. -Ring NHS Direct Wales on 0845 4647 for advice if you feel unwell and are not sure what to do next. Keep this number handy – why not store it in your mobile phone so it’s easy to find? 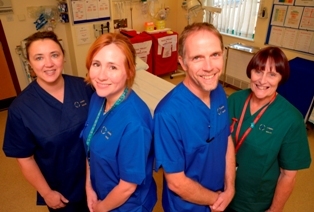 -The Emergency Unit at the University Hospital of Wales deals with serious accidents and emergencies, for example, broken bones, chest pains, excessive bleeding, loss of consciousness and people brought in by ambulance following 999 calls. The Emergency Unit at UHW is open 24 hours a day, seven days a week. You will be seen as soon as possible, but people with the most serious conditions will be seen first.